I was twelve years old and living in the heart of East Africa when I first heard of Pancake Day. A few British friends invited us over for pancakes and a pancake race, all in the name of "pancake day." We arrived to find little camp stoves set up outside with bowls dripping with batter placed beside them. A table was laden with plates and lots of cut lemons and sugar bowls. Pancakes began to pile up and someone began shooing people over to the side for a "pancake race." Each contestant was given a frying pan and a pancake. We were told to run the length of the driveway, frying pan in hand, flipping the pancake in the air at least once on the way. And then we were free to eat as many pancakes as we could, all dripping with melted butter, lemon juice and caster sugar. We kids thought it was a great idea! Pancake Day, or Shrove Tuesday as it is more widely known, is the day before the beginning of Lent. Pancakes were a great way to use up the excess of any fatty and rich foods before the beginning of Lent, and thus evolved Pancake Day. The pancake race is said to have originated in Olney, England in 1444 when a housewife ran out of the house on her way to church still clutching her frying pan with a cooking pancake in it. Put the flour and a pinch of salt into a large mixing bowl and make a well in the center. Crack the eggs into the middle, then pour in about 1/4 cup of the milk and the oil. Start whisking from the center, gradually drawing the flour into the eggs, milk and oil. Once all the flour is incorporated, beat until you have a smooth, thick paste. Add a little more milk if it is too stiff to beat. Finishing the batter: Add a good splash of milk and whisk to loosen the thick batter. While still whisking, pour in a steady stream of the remaining milk. Continue pouring and whisking until you have a batter that is the consistency of cream. Traditionally, people would say to now leave the batter for 30 minutes for all the starch in the flour to swell, but there's no need. Heat a non-stick pan over medium-high heat. Ladle some batter into the pan, tilting the pan to move the mixture around for a thin and even layer. Quickly pour any excess batter back into the bowl, return the pan to the heat, then leave to cook, undisturbed for about 30 seconds. If the pan is the right temperature, the pancake should turn golden underneath after about 30 seconds and will be ready to turn. Repeat with remaining batter. Store the cooked pancakes on a plate underneath a piece of foil. 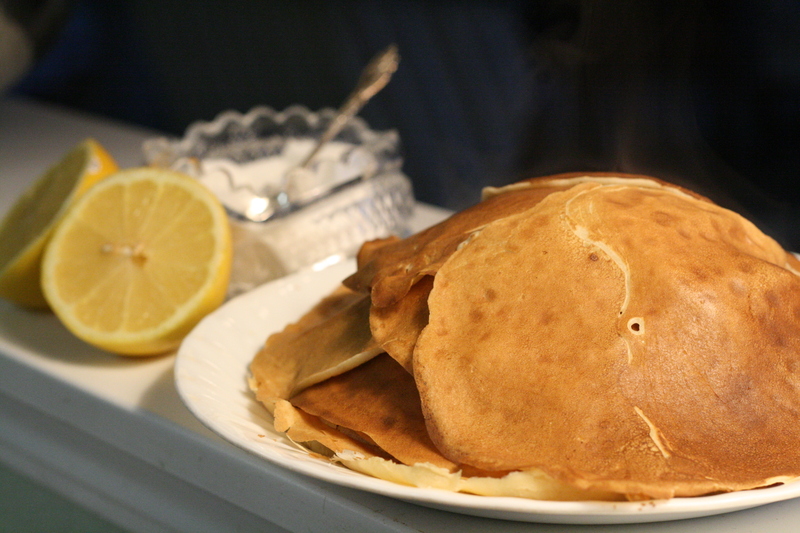 Serve pancakes with butter, lemon juice and granulated sugar. I like to then roll my pancake up and eat it with my fingers. Melt one tablespoon of butter in a large skillet over medium-low heat until it bubbles. Ladle the pancake batter into the pan to make 3-4 pancakes (I used a non-stick griddle, without the butter). Distribute a rounded tablespoon of bananas on each pancake (or, alternatively, add 2 mashed bananas to the bowl of batter). Cook for 2-3 minutes, until bubbles appear on top and the underside is nicely browned. Flip the pancakes and then cook for another minute until browned. Wipe out the pan with a paper towel, add more butter to the pan, and continue cooking pancakes until all the batter is used. Serve with sliced bananas, butter and maple syrup. Beat egg with milk and oil. Beat in remaining ingredients until smooth. For thinner pancakes, stir in additional 1/4 cup milk. Cook on a griddle or in a non-stick frying pan: pour about 3 Tbsp. batter from tip of large spoon or pitcher onto hot griddle. Cook pancakes until puffed and dry around edges. Turn and cook other side until golden brown. 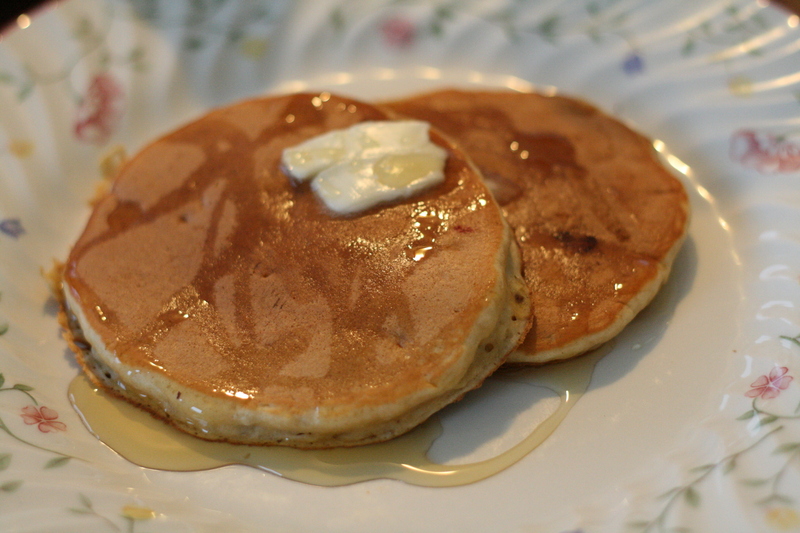 I keep our pancakes hot by placing them on a plate and covering with foil. Our family loves these with blueberries added -- about 1/2 cup fresh or frozen berries per batch of pancakes. Thanks for the delicious pancake recipes. One Sunday morning (in the Van de Ruit household, this is special breakfast day!) 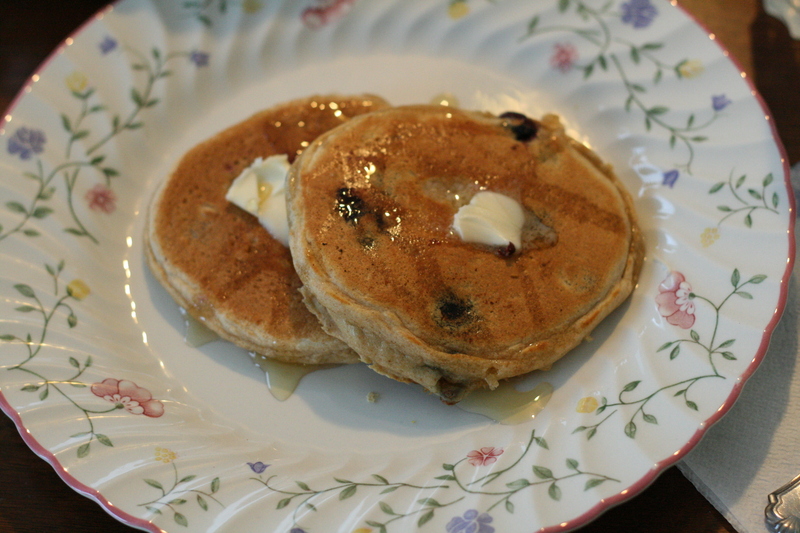 I made berry pancakes that called for blue berries. Hard to come by in Uganda of course! But somehow I'd managed to get some strawberries somewhere (admittedly small but still strawberries!) and had frozen them. They worked out DELICIOUS!! So really, use whatever you've got on hand with pancakes; any berries, sliced bananas, orange zest/juice, anything really. Mmm, I want some pancakes RIGHT NOW!! !